Harry Potter fans unite! Fantastic Beasts: The Crimes of Grindelwald is very nearly here, and after it arrives in cinemas on November 16, everyone is going to be talking about the shocking revelations of the Fantastic Beasts: The Crimes of Grindelwald ending. Following on from the events of Fantastic Beasts and Where to Find Them, The Crimes of Grindelwald takes us deeper into the wizarding world and explores the events leading up to the Wizarding Wars. Once you’ve seen it, all you’re going to want to do is dissect the unbelievable Fantastic Beasts: The Crimes of Grindelwald ending. And who can blame you? There’s a lot to discuss. 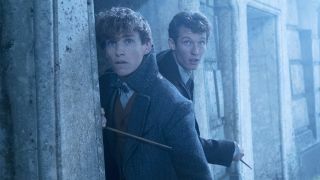 Nevermind what comes next, the Fantastic Beasts: The Crimes of Grindelwald ending includes plenty of previously unknown revelations about the Harry Potter universe as a whole. There’s also the next three Fantastic Beasts movie to consider as well. What has J. K. Rowling got planned for Fantastic Beasts 3, 4, and 5? Once you’ve seen the Fantastic Beasts: The Crimes of Grindelwald ending for yourself (but not before, because we’re going to delving deep into major spoiler territory), make sure you come back here to read all about the big questions we need answered. What’s that now? You already know too much?! Obliviate! 1. Who is Aurelius Dumbledore? This is the name Grindelwald ‘gives back’ to Credence Barebone in the movie. It’s supposedly his true identity, and if you’ve seen the Fantastic Beasts: The Crimes of Grindelwald ending then you also know that this means Credence is a member of the Dumbledore family. Other than the iconic surname, the fact that Credence has a phoenix seems to support the Dumbledore family legend that a phoenix will come to the aid of any family member in a time of need. But who is Aurelius Dumbledore really? If we assume that Grindelwald is telling the truth - and that’s a pretty big if - how is he related to Albus Dumbledore? A younger brother? Perhaps, but he could just as easily be a cousin or an even more distant relation of the Dumbledore family. As far as we know, our Dumbledore only had two siblings - a sister, Ariana, who died very young, and a brother, Aberforth, who blamed Dumbledore for Ariana's death. Hang on… have you noticed the pattern as well? It seems that Dumbledore's parents, Percival and Kendra, had an affinity for the letter ‘A’ which would certainly hint at Aurelius being a sibling rather than anything else. The fact that there’s no mention of a fourth Dumbledore sibling in any of the Harry Potter books or movies set after Fantastic Beasts: The Crimes of Grindelwald means that either Grindelwald is lying, or Dumbledore never publicly acknowledges his long lost brother. Is that because he eventually dies in the Fantastic Beasts series? Or because he needs to go into hiding, perhaps? Maybe Dumbledore just can’t bring himself to welcome his estranged sibling into his family? It doesn’t sound very Dumbledore-like, but as we know, he’s made mistakes before. 2. And why was Aurelius travelling to America without his family? If Credence really is Dumbledore’s long lost brother, why was he on a ship traveling to America, which led to his mistaken identity in the first place? And without his family too? We can assume that the woman he was with was not his mother, Kendra Dumbledore, as we know she doesn’t drown, but is accidentally killed by her daughter Ariana. However, she clearly cares for the child, as we see during the flashback sequence. Who is she? A nanny, perhaps, or maybe another Dumbledore relative? The way the camera focuses on her face indicates that we’ll find out in a later Fantastic Beasts movie, but to me, this is further evidence that Grindelwald is lying and Credence isn’t a Dumbledore at all. 3. Why was Credence given up to Mary Lou Barebone? During the Fantastic Beasts: The Crimes of Grindelwald ending, it’s revealed that Leta Lestrange switches her baby brother Corvus with another child - Credence - during a voyage to America. Tragically, when the ship sinks, her brother drowns while Credence is saved by their nanny, Irma Dugard, who believes him to be Corvus. We know that Credence is later given up to Mary Lou Barebone who raises him without magic (or love), which eventually turns him into an Obscurus. But if Irma believes him to be Corvus, why does she give him up to Mrs Barebone in the first place? Does Leta come clean and reveal what she’s done after they’re saved? Or does Irma realise for herself once all the commotion is over that she doesn’t recognise the baby in her arms? Clearly something happens to make everyone else realise that the baby isn’t Corvus, otherwise Credence would've been raised as a Lestrange without anyone but Leta being any the wiser. 4. Where is the older Corvus Lestrange? Throughout the entire revelation about Credence and Corvus, all I kept thinking was: where is the older Corvus Lestrange? We know from Yusuf Kama’s account and the flashback sequence that Leta’s father loved his son Corvus more than anything. In fact, it sounds like he was the only thing he did care about. So, when the rumours started circulating throughout the magical community that his long lost son might be Credence, why didn’t he try and find him? The most logical answer is that he’s dead and that’s why he never appears in Fantastic Beasts: The Crimes of Grindelwald, but that’s currently unconfirmed. 5. What does Grindelwald want with Credence? This is probably the most important question we have after watching the Fantastic Beasts: The Crimes of Grindelwald ending. Grindelwald has gone to extraordinary lengths to bring Credence into his fold, and we know it’s not because he thinks Credence is really a Lestrange, as he’s the one who reveals Credence’s true identity at the end of the film. While it’s questionable whether Grindelwald is telling Credence the truth, the fact remains that he needs Credence for something important, and it probably has something to do with him being an Obscurus. Think about it. Credence is an Obscurus because his magic was suppressed. Mrs. Barebone never told him about his wizarding heritage and never allowed him to perform spells, which eventually led to his magical abilities manifesting in dangerous ways. Throughout the first Fantastic Beasts film, Percival Graves (aka Grindelwald in disguise) tries to find the Obscurus and eventually succeeds when it’s revealed to be Credence. To go through such effort to identify the Obscurus in the first film, and then to again spend an enormous amount of energy to turn Credence to his side in the second film, hints to me that, as an Obscurus, there’s something Credence can do for Grindelwald that no-one else can. Exactly what is anyone’s guess right now, but Grindelwald does tell one of his followers during the film that Credence is the only one who can defeat Dumbledore. I didn’t give this much credit at the time because A) even as an Obscurus, Dumbledore is clearly more skilled and powerful than Credence, and B) why would Grindelwald even care about killing Dumbledore when the pact they made ensures they can’t fight each other? But the more I think about it, the more it starts to make sense. Dumbledore might not be able to fight Grindelwald head-on, but he’s certainly doing everything in his power to stop him indirectly, so this could be why Grindelwald wants him out of the way. And while Credence isn’t as skilled as Dumbledore, he still managed to blow a hole in the side of a mountain when Grindelwald hands him a wand at the end of film, which indicates he’s got a significant amount of power bottled up inside him. Plus, if he is Dumbledore’s long lost brother, that might give him an edge, as Dumbledore will no doubt want to save him rather than kill him. Could we see Grindelwald try and convince Credence that Albus is responsible for him being lost and never knowing his family? 6. What turns Nagini to Voldemort's side? The revelation that Nagini would be in Fantastic Beasts: The Crimes of Grindelwald was a big one. In the Harry Potter books and movies, Nagini is Voldemort's snake who does his bidding, including (but not limited to) eating people. Yikes! But The Crimes of Grindelwald reveals that Nagini used to be a woman with a blood curse who turns into a snake every night. Eventually, she won’t be able to transform back and will remain a snake forever, which is clearly what happens given that she’s a snake throughout the Harry Potter series. What we don’t know is how she meets Voldemort and why she becomes his ally. By the Fantastic Beasts: The Crimes of Grindelwald ending, Nagini is separated from Credence but hardly turned towards the dark side. In the company of Newt and co. when they arrive at Hogwarts post-finale, if anything, Nagini looks to be joining the good guys. Her story isn’t really explored in The Crimes of Grindelwald, so hopefully we’ll see more of her in the next Fantastic Beasts movie - and maybe even find out what happens to push her towards Lord Voldemort. 7. Will Queenie find her way back to her family? Possibly the most shocking turn of events during the Fantastic Beasts: The Crimes of Grindelwald ending (other than Credence’s true identity) saw Queenie join Grindelwald. It’s skillfully done, and you can see how Queenie is convinced by his charm and promises of freedom for all. All Queenie wants is to marry Jacob and have a family - something she can’t do under wizarding law in America right now - and Grindelwald makes a point of not harming anyone in public during the film, making himself out to be a freedom fighter rather than a killer. We have to assume though that he can only keep this up for so long, and eventually Queenie will realise the kind of person he is, but at what point? And will it be too late for her to turn back? She’s already in deep with Grindelwald’s supporters, and as a powerful mind reader, she’s an asset Grindelwald isn’t likely to want to let go of. Even more than that, once Grindelwald is defeated, Queenie might be held accountable for her part in his crimes and put on trial… and that’s if she makes it out alive. 8. What’s the importance of Grindelwald’s necklace? And can Dumbledore destroy it? The final moments of the Fantastic Beasts: The Crimes of Grindelwald ending see Newt hand over Grindelwald’s necklace to Dumbledore. It’s apparent in these moments why Dumbledore sent Newt (and his Nifflers) after Grindelwald in the first place, hoping that he’d be able to get the necklace from Grindelwald. But why? It appears to contain the blood of both Dumbledore and Grindelwald, and is part of a pact the pair made when they were younger (and friends) to never fight each other. This is what’s stop Dumbledore from facing Grindelwald head on up until this point, and explains why he’s told everyone (including the Minister for Magic) that he can’t fight Grindelwald. Dumbledore tells Newt that he’s going to try and destroy the necklace and therefore break the pact it contains, but it probably won’t happen for a while, as we can assume that the final showdown between Dumbledore and Grindelwald happens in Fantastic Beasts 5. We know he must manage it eventually, as Dumbledore’s defeat of Grindelwald is mentioned in the Harry Potter series - but a lot could happen between now and then. What the best Harry Potter movie ever? We try and rank ever film from The Philosopher’s Stone to The Crimes of Grindelwald.